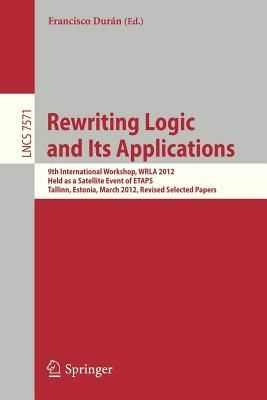 This book constitutes the thoroughly refereed post-workshop proceedings of the 9th International Workshop on Rewriting Logic and its Applications, WRLA 2012, held as a satellite event of ETAPS 2012, in Tallinn, Estonia, in March 2012. The 8 revised full papers presented together with 4 invited papers were carefully reviewed and selected from 12 initial submissions and 5 invited lectures. The papers address a great diversity of topics in the fields of rewriting logic such as: foundations and models, languages, logical and semantic framework, model-based software engineering, real-time and probabilistic extensions, verification techniques, and distributed systems.